GIBB Building Maintenance believes that carpeting is an investment and when maintained properly, it brings returns by enhancing your building’s décor and function. When your carpeting is allowed to undergo unnecessary wear and soiling, or it becomes a staging area for dust, spores, and other airborne contaminants, it can have a negative impact on your bottom line, the aesthetic appeal of your work environment and your building’s indoor air quality. Proper cleaning protects your investment by achieving a pleasant appearance, reducing wear on the fibers, and lowering the chance of dirt spreading further into your building. Being aware of available carpet cleaning methods, and more importantly, applying them in appropriate combinations and frequencies can protect your investment. There are three primary methods of carpet cleaning: dry, deep (wet), and combo. Deep cleaning is sometimes referred to as ‘Steam Cleaning’. Deep cleaning is required less often than dry cleaning, but is the most effective part of a carpet-cleaning regimen. With this cleaning, the effected area reaches all the way to the base of the carpet, dissolving and collecting contaminants for removal to a holding tank. The long dry times (approximately twelve hours) usually require this method be performed during off-hours or placing the area out of service. The advantage of this system is the ability to flush out large amounts of soil and contaminants in the carpet. It is the most preferred method by all of the major fiber and carpet producers. Deep cleaning extraction is favored by the Environmental Protection Agency (EPA) and is the preferred method of the Institute of Inspection, Cleaning and Restoration Certification (IICRC). Deep cleaning remains unrivaled in its effectiveness and should be performed at least once each year or more often depending on the traffic, type of carpet, and building type. Dry processes are considered environmentally preferable because they use less cleaning solution and very little or no water. The dry foam method is a very effective low moisture, rapid drying method. A circular rotating buffer or counter-rotating brush machine is used to agitate the carpet pile while the cleaning solution foam is dispensed into the rotating brushes. The cleaning solution is allowed to dry to a flaky or crystallized powder suspending the dirt and contaminants away from the carpet fibers. Vacuuming the carpet finishes the process by physically removing the soil particles. The top 1/3 of the visible carpet pile is cleaned. Dry extraction processes are generally used for the maintenance of your building’s commercial carpets between applications of the more intense wet extraction methods on a monthly or quarterly basis. A cleaning solution is sprayed onto the carpet surface and a circular rotating buffer with absorbent rayon, cotton, and/or polypropylene pad attached is used in a side-to-side motion on the carpet surface. The soil attaches itself to the pad and the pad is replaced as it becomes dirty. 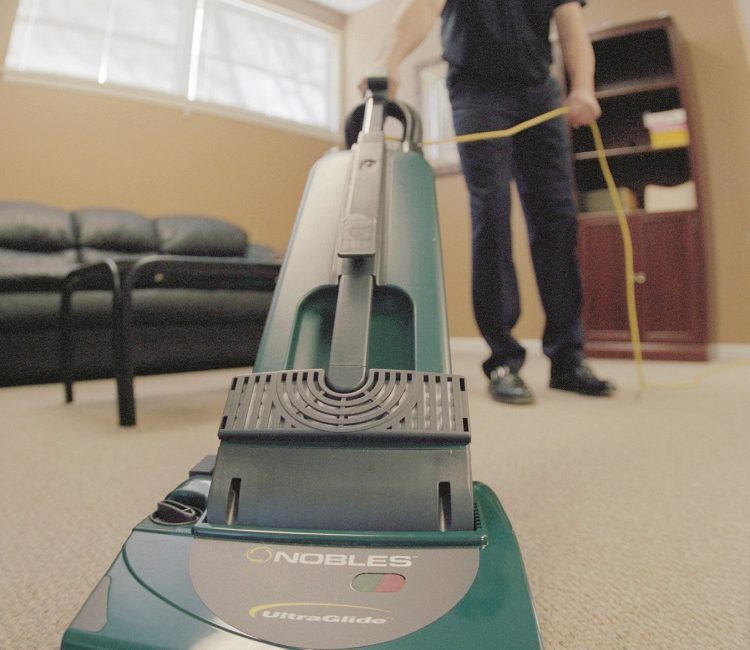 Vacuuming the carpet finishes the process by physically removing the soil particles. The top 1/3 of the visible carpet pile is cleaned. Bonnet method is most effective for routine maintenance cleaning (Monthly or quarterly) on commercial carpet types.